Once in a while I buy a book that I know I will never sell or give away. But I will lend that book, talk about the book and even put an ad for it on my blog. 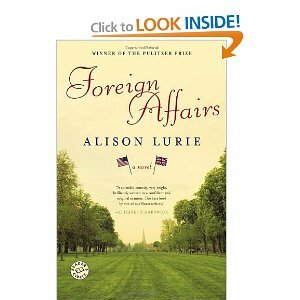 Foreign Affairs: A Novel (buy it here new or used) by Alison Lurie is one of those books. On a cold blowy February day a woman is boarding the ten a.m. flight to London, followed by an invisible dog. The woman’s name is Virginia Miner: she is fifty-four years old, small, plain, and unmarried—the sort of person that no one ever notices, though she is an Ivy League college professor who has published several books and has a well-established reputation in the expanding field of children’s literature. The thing is, one doesn't find a prize winning book that contains quirky character like this or even a love story that is uplifting. This book was like a beautiful song. But win prizes it did. Even after almost 30 years Foreign Affairs has not lost it's magic. Get this one...you won't regret it. Thanks! Just ordered it on paperbackswap.com.